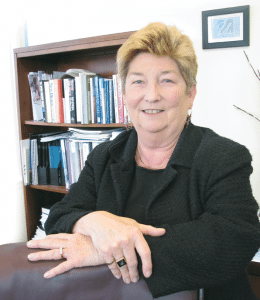 While J. Lynn Griesemer still hears the phrase ‘think tank’ used in reference to the University of Massachusetts Donahue Institute (UMDI), she acknowledges that she’s heard that largely inaccurate description less often in recent years. And she believes that’s because more groups and individuals are coming to understand that this agency, attached to the UMass President’s Office, is so much more than that. Indeed, while the institute certainly has its share of experts among its 100 employees — on subjects ranging from the U.S. Census and the numbers it generates to passenger rail service in the Northeast Corridor — and has been called upon to conduct research on matters as disparate as college-graduate retention rates and the workforce needs of the state’s life-sciences industry, it also boasts a number of programs that one might not expect from a pure think tank. For starters, said Griesemer, the agency’s executive director, there’s a so-called special initiative called the Academy for Newly Elected Legislators. This is a biannual program (senators and representatives are elected to two-year terms) that the institute funds from its own budget. It’s designed to help newcomers to Beacon Hill with everything from understanding the nuances of the state’s budget to dealing with the media. Couple these initiatives with long-standing Donahue Institute programs involving everything from the training of state employees to workforce-development initiatives to early-childhood-education services, and it’s easy to see why the term ‘think tank,’ while in some ways appropriate, doesn’t quite cover things. And this lack of a simple descriptive phrase makes the institute quite unique, said Eric Heller, its deputy director, who spends a good amount of his time educating people about what the UMDI does and how it does it. But there remains a large and vibrant research component at the institute, as evidenced by the white board that dominates one wall in the office occupued by Dan Hodge, the recently named director of the agency’s Economic and Public Policy Research department. It lists more than a dozen potential projects, or “opportunities,” as he called them, and several initiatives already underway, including a study on the growth potential of the manufacturing sector in the Berkshires, commissioned by the Pittsfield Economic Revitalization Corp., and another research project, undertaken for the Boston Redevelopment Authority, on retention of college graduates. 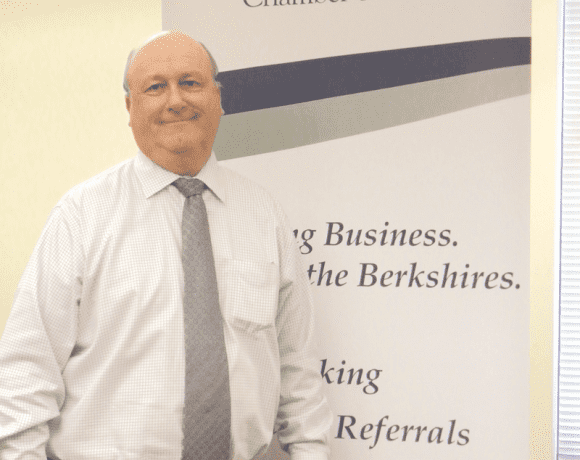 Dan Hodge is currently overseeing projects on matters ranging from the industrial sector in the Berkshires to growth issues involving businesses across the region. 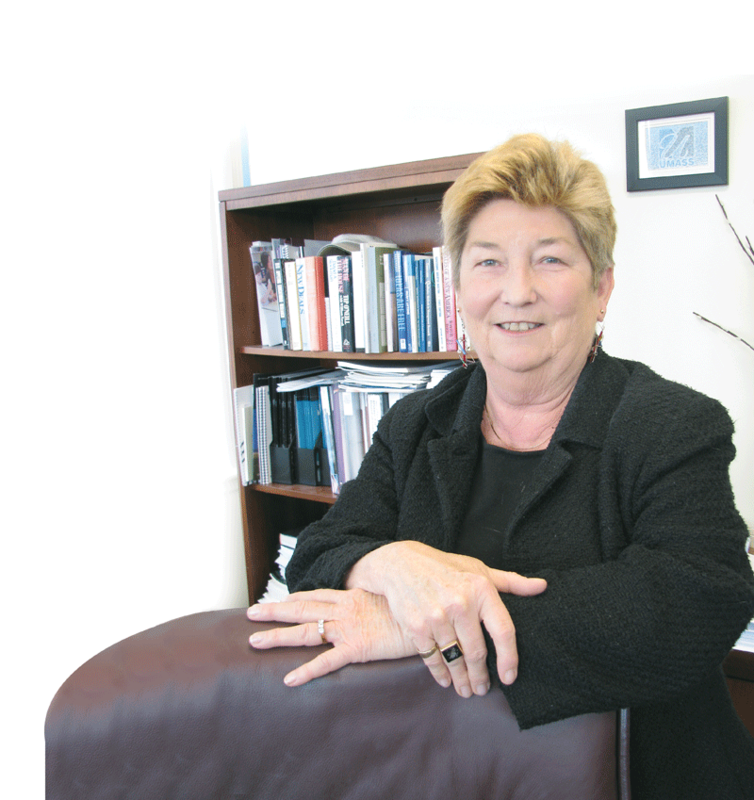 For this issue, BusinessWest takes an in-depth look at the Donahue Institute and the many kinds of work it undertakes within the Commonwealth and beyond. Griesemer was somewhat apologetic when she brought up another of those special initiatives involving the UMDI — research into the feasibility and practicality of a UMass satellite facility in downtown Springfield, a development that many believe would bring foot traffic and therefore more vitality to the city’s central business district. That report is nearly ready, she said, but isn’t something she can talk about in any detail until the ink is officially dry and the product has been delivered to the client — in this case, the President’s Office itself. There have been countless similar initiatives since the UMDI was created by an act of the state Legislature in 1970 and eventually led by former state Senate President Maurice Donahue, a Holyoke Democrat who was looking for a new challenge after leaving his Senate seat for what turned out to be an unsuccessful run for governor. The institute was originally charged with “bringing the intellectual resources of the university to bear on the needs of the Commonwealth and its citizens,” said Heller, adding that this unofficial mission, while intact, has evolved and manifested in a number of ways over the past 43 years. 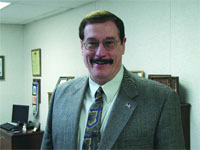 In the beginning, for example, much of the emphasis was placed on training and educating individuals involved in state and local government, said Griesemer, adding that the federal government was pumping large sums of money into such initiatives in the early and mid-’70s. One of the institute’s early programs, for example, was an annual ‘cherry sheet conference,’ created to help officials in cities and towns understand the state appropriations that were detailed on documents that came in that unusual color. 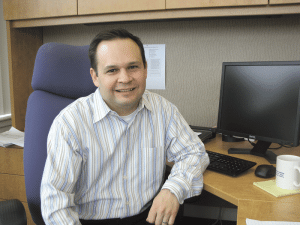 “We still do a lot of work with those in state and local government, but from that beginning, the institute has grown and evolved significantly,” Griesemer explained, adding that it now has a staff of 100 and six business units handling roughly $15 million in contracts and grants each year. The UMDI will handle roughly 140 contracts each fiscal year, with dollar amounts ranging from a few thousand to several million. Those six business units are Applied Research & Program Evaluation, Economic & Public Policy Research, Organizational Development & Learning Solutions, Early Childhood Services, Workforce Development Services, and Civic Initiative/International Programs. 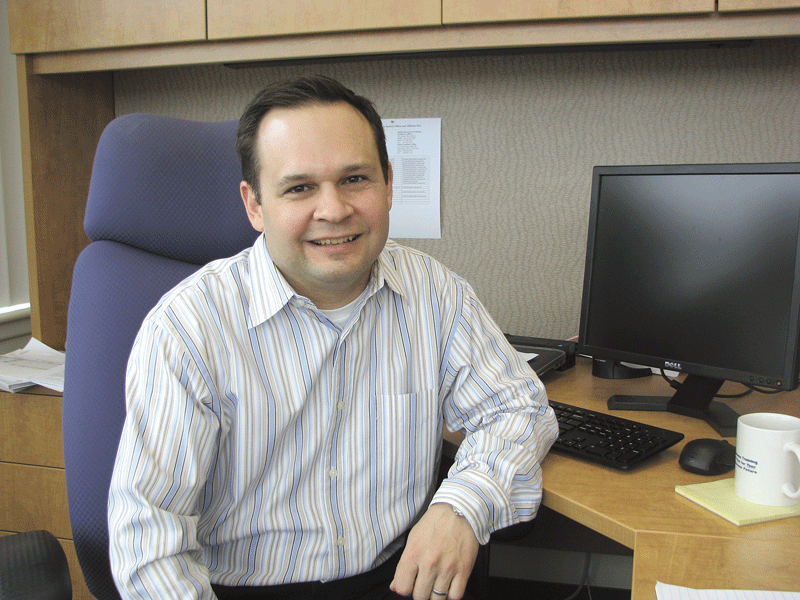 A seventh unit — Financial Management Education & Training — is being phased out. As it goes about that broad assignment, the UMDI serves clients in the public, nonprofit, and private sectors through grants and contracts, Heller went on, noting that the institute works throughout Massachusetts, across New England, nationally, and also through international programs. In doing so, it routinely collaborates with a broad range of individuals and organizations to meet client needs, including UMass faculty, independent consultants, and other consulting organizations. And, in some cases, the university itself is the client. The institute is headquartered in Hadley, at a facility within the WestMass development known as University Park, and also has a facility in Brockton that houses a career center for employers and displaced workers, another in Shrewsbury that houses the Applied Research & Program Evaluation unit, and other operations scattered across New England and also in Washington, D.C.
And while its role extends well beyond pure research and advocacy, some of its most important work falls within those realms. As an example, Griesemer cited important work it does for the state with regard to the Census. 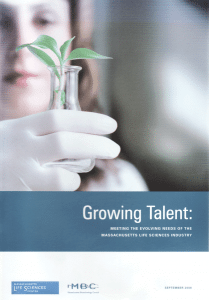 And there are some of those aforementioned white papers, or detailed reports for clients, said Heller, listing, as just one example, a document called “Growing Talent: Meeting the Evolving Needs of the Massachusetts Life Science Industry,” which was prepared by the institute and commissioned by the Massachusetts Life Sciences Center and the Massachusetts Biotechnology Council. Some of the UMDI’s most visible work falls to the Economic & Public Policy Research unit, which Hodge took over just a few months ago. He had been working as an independent consultant after stints with Regional Economic Models Inc. (REMI) in Amherst, a venture started by a long-time UMass Amherst economics professor; Cambridge Systematics, known for transportation-related policy and planning work; and the Boston-area office of engineering and architecture company HDR, when the position became open. Hodge said he was intrigued because the job presented him with an opportunity to blend his experience in research with many recent projects that have made him familiar with this region, its economic-development leaders, the issues it faces, and its prospects for growth. These include a study undertaken while he was at HDR that focused on passenger rail service in the so-called Knowledge Corridor, which stretches from Northampton to New Haven, Conn., which was undertaken for the Pioneer Valley Planning Commission, and another initiative involving the High Performance Computing Center in Holyoke and the development of an innovation-based economic-development strategy for Holyoke and the Pioneer Valley. “The big thing for me was a chance to continue to focus on the Massachusetts economy,” he told BusinessWest, adding that he and his team do this through analysis of current economic trends and statistics (Hodge presented a broad overview of the state’s economy at the Affiliated Chambers Outlook Luncheon, for example), and also through various projects, such as those currently listed on that white board in his office. “To a large extent, we function almost as a quasi-consulting group within the university,” he explained, adding that the institute is being called upon to conduct research and then analyze the resulting data on a host of timely matters. The study on manufacturing in the Berkshires, for example, was commissioned to identify potential growth areas for a region known more for its tourism-related businesses and institutions, at a time when it is trying to diversify its overall economy. “Growing Talent,” a report undertaken for the Life Sciences Institute and the Mass. Biotechnology Council, is one of hundreds prepared by the Donahue Institute since 1970. Another current initiative undertaken by Hodge’s division is a business-growth study for the Pioneer Valley, a project undertaken for several clients working collaboratively, including Common Capital, the PVPC, the Economic Development Council of Western Mass., and the Franklin Regional Council of Governments. The specific assignment is to create a detailed profile of existing businesses in the region and identify growth trends among individual sectors and companies. A key component of the work is a detailed business survey designed to identify both the factors likely to stimulate or restrict growth and the types of support needed, said Dodge, adding that the initiative has thus far generated nearly 200 responses from Hampden, Hampshire, and Franklin counties. While handling those 140 contracts, or assignments, each year, Griesemer said, the Donohue Institute must also do some strategic planning of its own, to remain effectively positioned to meet the needs of its many kinds of clients. “In this business, you have to be constantly scanning the environment to see what’s emerging,” she explained. “The development of each of our units has a history behind it; they all came about because of opportunities — what was out there as far as recognized needs, and could we meet those needs? That continues today. These thoughts bring her back to the uniqueness of the institute — “there are organizations within universities that will do one of the pieces of the institute’s work, but not all the pieces,” she said — and some of the work it does that falls well outside basic research or consulting. And the STEM Summit, co-sponsored by businesses and institutions ranging from Raytheon to Westfield State University, is a perfect example. “This is an event that’s grown steadily over the past 10 years, and taking it to Gillette Stadium has taken it to a new level,” said Heller, adding that the program has drawn attendees from across the country who want to learn about the state’s aggressive approach to tackling the STEM challenge, and how the summit is a key component in those efforts. The Academy for Newly Elected Legislators is another example. The three-day, non-partisan program, jointly conducted with the president of the Senate and speaker of the House, falls under the category of community service and speaks to the original motivations for creating the institute, said Griesemer. “We focus on everything from communication, working with the press, to ethics, how the budget works, and the overall process — what happens when you’re on the floor of the House or Senate,” she explained, adding that there was a special program this year on the economy and the budget featuring Michael Widmer, president of the Mass. Taxpayers Assoc., and Michael Goldman, co-editor of MassBenchmarks. Looking ahead, Griesemer and Heller said that, because much of the institute’s work is generated by federal grants and contracts, the agency is watching the phenomenon known as sequestration very closely. As an example, Heller cited work handled by the Applied Research & Program Evaluation group, which will often collaborate with the state Department of Elementary and Secondary Education on projects funded by federal grants. Beyond that, well, it’s often up to clients to decide what’s next for the UMDI, said Heller and Griesemer, before quickly adding that the institute can in many ways help clients and potential clients figure out what’s coming down the road. “All of our clients will tell us what’s next,” said Griesemer, “but we also engage heavily with clients about shaping their own thoughts about what’s next. And that’s tricky business, because sometimes clients will be absolutely convinced that it’s this, or the facts are that. But one of our first engagements with a client is always around helping them shape what the questions are and what they’re really trying to accomplish with an engagement with us. Such involvement is just another example of how the institute is not like most other consulting organizations, and why ‘think tank,’ doesn’t always, or even usually, work when describing the institute and what it does within and for the Commonwealth. Heller doesn’t have a simple one- or two-word phrase to sum it all up, and that’s one of the challenges he faces when he goes about explaining the UMDI’s mission and how it’s carried out. It takes probably a full sentence or two to do that, he said, and it comes down to not only coming up with the answers, but helping clients understand — and formulate — the questions.